Flamingo Oasis Hotel is located 950 yards from the seafront and 600 yards from Rincon de Loix. Plenty of local shops, bars and restaurants are in close proximity. The Flamingo Oasis offers 2 buffet style restaurants with three themed nights a week, pool bar, swimming pool with sun terraces, sauna, gym and 24 hour reception. The Flamingo Oasis also provides a programme of entertainment for its guests. Guestrooms at the Flamingo Oasis Hotel consist of two, three or four beds and offer TV, room safe, air-conditioning, telephone, bathroom and balcony. Single rooms are also available. "Great Hotel Had A Lovely Room"
Great hotel had a lovely room overlooking the mountains on the 24th floor. 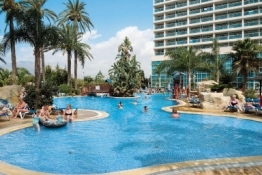 The Hotel Flamingo Oasis is a real treat compared to some other hotels in Benidorm! Hotel kept clean and the food was fab you are spoilt for choice here, entertainment was great too they all work very hard. "Not Worth A 4 Star In My Opinion"
If you like a noisy hotel, queue and to run for your sunbed at 8.30 in a morning, then this is the place for you. The positives are it is clean and the food is good, but you have to queue for all your meals, which you don't mind but you have to wait to be seated even if there are numerous seats which you can just go and sit at. The pool is a health and safety hazard, we were packed in around the pool, but nothing was said about people putting their sunbeds anywhere where there's a gap, I was surprised there, wasn't an accident. The entertainment was very poor for the kids animation did the entertainment and it was very repetitive, I think Thomson would have done a better job, better than lip-synching to a record! Not worth a 4 star in my opinion it needs a lot of tweaking to be a 4 star. "The Hotel Is Spotless And Beautiful"
This hotel is fab. The hotel is spotless and beautiful. The rooms are cleaned and towels changed every day. There were five of us and I found the room a little small but the bathroom and wardrobe space was terrific. The food was excellent and the drinks were great, the kids loved the kids cocktails. The alcohol was pretty good, always good measures. The entertainment was outdoor at night and was tacky but fun. If there was an entertainer not suitable for kids at night a film would be put on inside and kids taken in with the mini club staff and older kids could play football. The kids preferred the mini club which is the hotels own club to the Thomson's club. Possibly because they liked the entertainment staff and they took it in turns to run the club. There were activities during the day for adults and kids. The mini golf and table tennis etc are part of the all inclusive which is great. This hotel is great I'm sure everybody will like it. I loved it, the pool is brill, Food, entertainment and a lots more. The only downside is the smoking, if it hadn't been so nice and the entertainment was indoors it would have been horrible. The only no smoking area is the restaurant, not good for families and non smokers. Overall I would recommend this hotel, it is excellent.